We’ve seen the movement toward a cashless society take root in India, Sweden, other parts of Europe and the United States. Now the call is being heard in Australia. The Australian Broadcasting Corporation (ABC), the leading media channel in Australia, features an in-depth interview with Harvard Professor Ken Rogoff, author of the new book, The Curse of Cash, and a leading voice calling for the elimination of cash. You can read an overview of the interview here . As usual, those calling for the elimination of cash point to drug dealers and tax evaders as a main reason to ban large-denomination bills. It’s true that some criminals use cash, but they also use precious metals, art, bitcoin and other techniques to evade detection. Meanwhile, honest citizens use cash everyday out of simple preference or convenience. In particular, many poor people use cash because they don’t have bank accounts and don’t qualify for debit or credit cards. Since when has the presence of criminality been an excuse to snuff out liberty? Our legal system is specifically designed to protect the rights of the innocent even if it means a few criminals go free. Rogoff’s war on cash turns this principle on its head and treats honest citizens like criminals merely because they prefer cash. 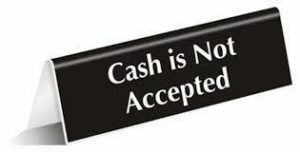 Hopefully, the anti-cash disaster unfolding in India will be a wake-up call for Australia before they succumb to the arguments of the cashless snake-oil salesman from Harvard.